Royal Mail: isn’t it quicker to knock? A quick search shows I’m not the only one this has happened to: having been in all day long I discover a card from Royal Mail has come through the door saying “Sorry you were out” and telling me to pick up a parcel the next day. 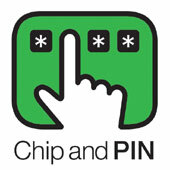 Part of the problem with Chip and PIN is the logo. It subliminally tells you to use one out-stretched finger to type in your PIN, in full view, as clearly as possible to any onlookers. This seems to be the wrong message. There are plenty of things wrong with Chip and PIN, but mostly it isn’t an intentional lowering of security. (In fact it mostly seems to be about shifting liability onto the consumer). But this logo doesn’t even seem to be trying to get it right. Earlier this year I took five side-by-side pictures of Bournemouth Pier and stitched them together using hugin. It’s quite easy: you just click somewhere recognisable on one photo, click on the same feature in another, and repeat several times. I took the entire set of pictures with exposure lock set, although it doesn’t seem to have worked very well for a couple of them. Having recently purchased a new camera, a Fuji Finepix S8000fd with 8Mpixels & a SuperMacro facility focusing down to 1cm (0.4″). I placed a slide on a small lightbox and held the camera approximately this distance in front of the lens and produced a fair digitized copy. Even the facial detection system works in this copy mode! To eliminated camera shake and make the copying easier I then designed and manufactured a simple rig to attach the camera to and position the slide to be copied at the correct distance cover the entire film area, negating any need to crop the digitized image as the camera has a 3:2 quality setting. I have used this rig with both a lightbox and with a white diffuser positioned behind the slide using either the sun or a 60watt lamp as the light source. The beauty of this rig is that it doesn’t require a steady hand (older people again) or the use of a tripod. Ever since I heard it was possible I’d been meaning to set up passwords with my utility companies so that they can verify their identity to me when they turn up at my door. This week I tried it with my gas supplier. They said they don’t do that, but don’t worry, it’s fine, I can just check their ID card and phone up to verify that the name on the ID card is one of their employees/contractors. You are currently browsing the PRINT HEAD weblog archives for November, 2008.